You may have heard about the benefits of TimeXtender’s high-performance data management platform and what it can be used for. You should, however, be aware not only of what Discovery Hub® can do but also why Discovery Hub® is so unique in what it does. 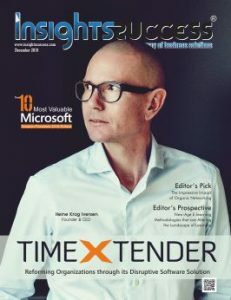 Recently, Insights Success featured an article about TimeXtender, using the title "Reforming Organizations through its Disruptive Software Solution" to describe the data management platform and its effect on the analytics space. To quote Wikipedia, the term ‘disruptive’ refers to: "an innovation that creates a new market and value network and eventually disrupts an existing market and existing value network." The existing market believes that BI, in general, can only be facilitated by external, skilled and expensive consultants, who visit the company perhaps once or twice per week (more frequently is usually too expensive) and implement the most urgent needs and wishes the company has from an ever-growing list of requests. Less important wishes (e.g., new data reporting or changes to existing data reporting) are never implemented, despite there being employees who require these wishes to be fulfilled to be more productive or bring more value to the organization. The consultants write code (SQL, SAS, etc. ), which is difficult and time-consuming to modify, and which is rarely understood by the business’ non-IT professionals. The code is usually a one-time solution which cannot be reused in the future and is difficult to maintain. Any changes in any IT system used by the company every day can immediately break existing data reporting, and people are forced to wait a few days for the reports to be fixed. Additionally, the consultants need to spend roughly half an hour or more just to notice that there is a different table column name or a different data type implemented by programmers in a data source, or maybe even a slightly longer comment about a customer typed in by an employee during his or her daily work. Coordinating all possible changes between the BI and IT departments is practically impossible, given how many people are involved in making changes–especially if they work in different companies. If you add time pressure, difficulty in foreseeing problems, and other restrictions–like rigid change management procedures, ISO, involving intermediate project managers, and plain human communication–you will get a picture of the challenges that BI and IT must face. A simple and obvious report–clearly needed by the business personnel to cope with the dynamic environment the company lives in–becomes quite time-consuming and expensive to develop, modify and maintain. This is also one of the reasons why BI is usually kept outside of the IT department’s rigid world. I have experienced all these problems myself, so I can comprehend why most companies seem to believe that there cannot be any other way to perform BI tasks. To be honest, I believed the same. TimeXtender’s Discovery Hub® is not just another tool for BI. It is a disruptive tool. Firstly, it can facilitate practically any BI project and can be used to make all kinds of data available for reporting from any number of data sources with a few clicks of the mouse. The code (SQL) is generated automatically, and users are not required to understand SQL at all. Therefore, it can be used by non-IT-skilled personnel in-house—even by people outside of the IT department. The process is not only more cost-efficient but also the people creating the reporting or analysis usually have a far better understanding of the company’s specific business than IT people, especially IT professionals from another company. However, this also benefits the external consultants a company might bring in, as the more time-consuming, repetitive tasks are automated with Discovery Hub®, allowing them to use their quality time on more pressing, advanced tasks. It is an advantage that cannot be overestimated, and a win-win-win solution for IT Teams, external consultants and companies as a whole. Secondly, the same job is done significantly faster, so more reports can be done from the ever-growing list of wishes—if not all. If any change happens in the source system and the reporting breaks, non-IT-skilled personnel can see within seconds where there is a new name or data type, and can easily modify the report logic accordingly, using mostly the mouse. It is a brand-new quality of analytics, not just another product. Thus, we need to challenge the fixed beliefs in the industry and emphasize that a software solution that can perform all these tasks exists and that it is indeed possible for non-skilled personnel to replace skilled consultants. This should be the priority and focus rather than to compare between Discovery Hub® and traditional BI products, considering the unique ways the platform operates and performs. Seeing as Discovery Hub® streamlines and simplifies BI and data analytics tasks, there is a potential to go beyond the existing BI needs and do things that would be considered either impossible or too expensive to be feasible to do with traditional BI tools. You can for instance connect any new ERP or CRM system to the existing BI solution or move all BI data from the company to the cloud (Azure) and apply Artificial Intelligence for data analysis without changing the IT-infrastructure, without new software development and even without the need to involve the IT department or skilled IT-technicians for tasks other than IT security and adhering to rules and procedures. This is what TimeXtender aims for: to make the formerly impossible, possible. Discovery Hub® is not only disrupting the BI space but fundamentally expanding on it. Interested in seeing how your company can start the journey towards a digital transformation with our disruptive software solution? Reach out to one of our many TimeXtender partners to hear more about our unique data architecture platform. Find a partner near you!